Rotherham may well have lost a derby, but they should be encouraged by some aspects of the defeat at Clifton Lane by four tries to three. 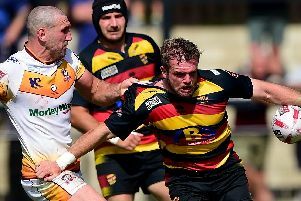 The Titans competed against the promotion candidates for a full 80 minutes and while understrength because of injuries, they scored three good tries which should give them confidence going into Friday evening’s league game at Bedford. The pack, camped on the Carnegie line, laid on an opportunity spotted by centre Joe Barker during a decent spell for Rotherham in the first half, and then in the second, excellent tries by replacement flanker James Sanderson and full back Will Goodwin cut the Carnegie lead to 30-21 on 70 minutes. Sanderson, an 18 year Leeds University student from Wath where his father played rugby, took his scoring opportunity in a flash. The ball bounced kindly as Carnegie lost control, Sanderson then sprinted 40 metres to the line to touch down on 55 minutes for a memorable try on his Championship debut. “I’ve grown up in Wath so I’m a Rotherham lad. I ended up for two years at the Leeds academy, but dropped out. “I was then picked up by Justin Burnell, the Titans coach, who saw me play with Rotherham Sevens in the summer. “So he asked me to train with the first team squad. It would have been nice to get a result, but it was so good to get a run-out for 30 minutes and to get a try in front of the home crowd just tops it off. “I found the game physically very demanding and the Championship is a lot higher than the standard I’ve played before,” said Sanderson, who before he went to university recently had been awarded a rugby scholarship by an independent school in Harrogate. While Carnegie’s forwards were overall too powerful for Rotherham, the Titans’ pack did set up the try of the game, scored by Goodwin. Once again, Will Thomas, this time on the wing, showed what a dangerous and exciting player he is on the attack. The Welshman burst through the middle, shattering Carnegie’s defence, and then timed his pass perfectly to Goodwin, another talented back, to touch down in the corner for a thrilling score that was appreciated by Sir Ian McGeechan, the Carnegie chairman and former British Lions coach. However, in the last 10 minutes, Rotherham could not improve their position and with Carnegie adding a fourth try to guarantee victory, the Titans also failed to earn a losing bonus point which their efforts deserved. Burnell’s side, which will also be understrength at Bedford, need to learn from their mistakes, but aspects which have improved aretheir tackling and defence. Rotherham Titans: Goodwin, Hayes, Owen, Barker, Thomas, Robinson, Dudman, Williams, Graham, Herriott, Salmon, Hicks, Grange, Oliver, MacDonald. Replacements: Maddison, Hutchinson, Rees, Normandale, Sanderson, Walsh, Foley. Tries: Barker, Sanderson, Goodwin. Conversions: Robinson 3.